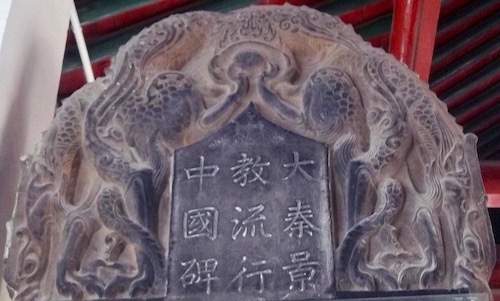 The literal meaning in English is “Stele to the Propagation in China of the Luminous Religion of Daqin.” Daqin was what the Chinese called the Roman Empire or Syria in particular. 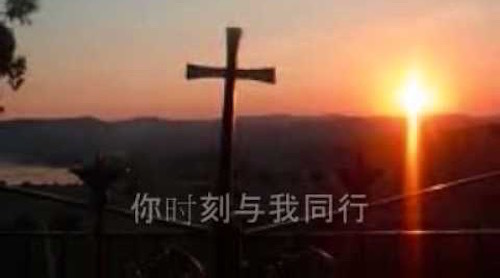 Written in Chinese and Syriac, the stone describes the existence of Christian communities in several cities in northern China. The Stele was buried in 845, probably during religious persecution. The Stele was not rediscovered until 1625, 780 years after it was buried. Nestorianism was named after the Christian theologian Nestorius (386–450), Patriarch of Constantinople from 428 to 431. 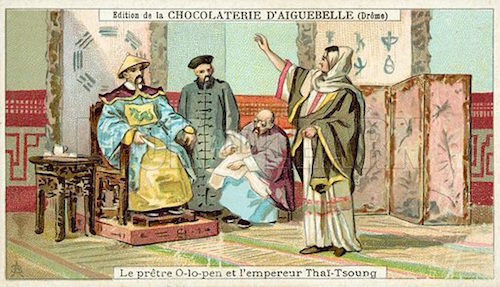 At that time in history (8th century AD), the Nestorian Christian church had been accepted as a legitimate religion by the Tang Emperor Taizong. 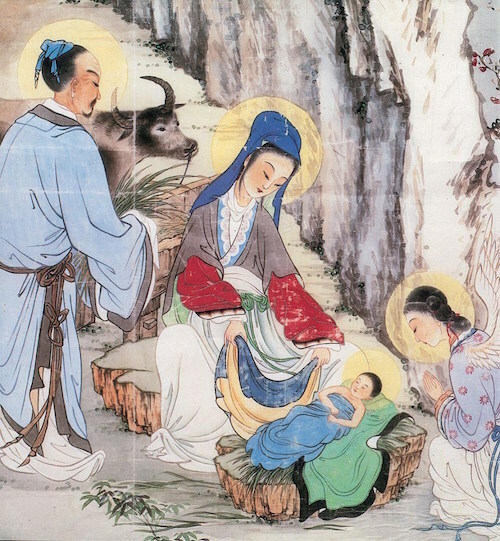 The missionary Alopen (Chinese: 阿罗本 pinyin: Āluóběn) in 635 AD stood before Emperor Taizong and presented to him the Bible and the words of Jesus Christ in the Gospels. The Syrian Alopen is the first missionary we know for sure (as a result of the Nestorian Stele) to have travelled the Silk Road all the way to China. The following is an edited version (by this writer) of the contents of the Nestorian Stele. “Behold the unchangeably true and invisible, who existed through all eternity without origin; the far-seeing perfect intelligence, whose mysterious existence is everlasting; operating on primordial substance he created the universe, being more excellent than all holy intelligences, inasmuch as he is the source of all that is honorable. 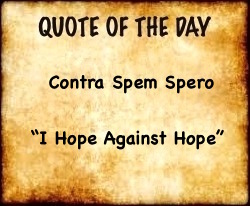 …the ancient dispensation, as declared by the twenty-four holy men ( Old Testament prophets? 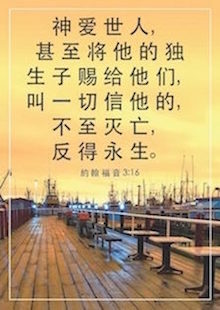 ), was then fulfilled, and he laid down great principles for the government of families and kingdoms; he established the new religion of the silent operation of the pure spirit of the Triune; he rendered virtue subservient to direct faith; he fixed the extent of the eight boundaries, thus completing the truth and freeing it from dross; he opened the gate of the three constant principles, introducing life and destroying death; he suspended the bright sun to invade the chambers of darkness, and the falsehoods of the devil were thereupon defeated; he set in motion the vessel of mercy by which to ascend to the bright mansions, whereupon rational beings were then released, having thus completed the manifestation of his power, in clear day he ascended to his true station. 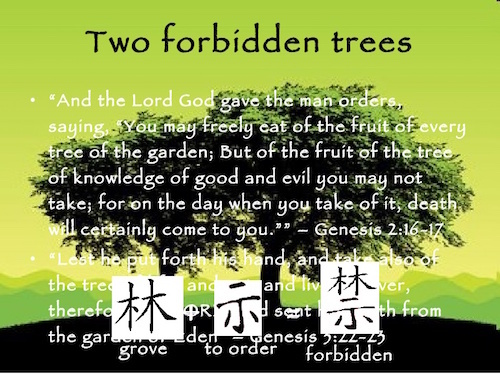 Twenty-seven sacred books (the number in the New Testament) have been left, which disseminate intelligence by unfolding the original transforming principles. 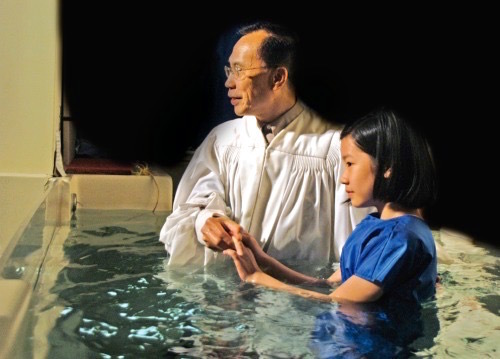 By the rule for admission, it is the custom to apply the water of baptism, to wash away all superficial show and to cleanse and purify the neophytes. …As a seal, they hold the cross, whose influence is reflected in every direction, uniting all without distinction. As they strike the wood, the fame of their benevolence is diffused abroad; worshiping toward the east, they hasten on the way to life and glory; they preserve the beard to symbolize their outward actions, they shave the crown to indicate the absence of inward affections; they do not keep slaves, but put noble and mean all on an equality; they do not amass wealth, but cast all their property into the common stock; they fast, in order to perfect themselves by self-inspection; they submit to restraints, in order to strengthen themselves by silent watchfulness; seven times a day they have worship and praise for the benefit of the living and the dead; once in seven days they sacrifice, to cleanse the heart and return to purity. It is difficult to find a name to express the excellence of the true and unchangeable doctrine; but as its meritorious operations are manifestly displayed, by accommodation it is named the Illustrious Religion. Now without holy men, principles cannot become expanded; without principles, holy men cannot become magnified; but with holy men and right principles, united as the two parts of a signet, the world becomes civilized and enlightened. 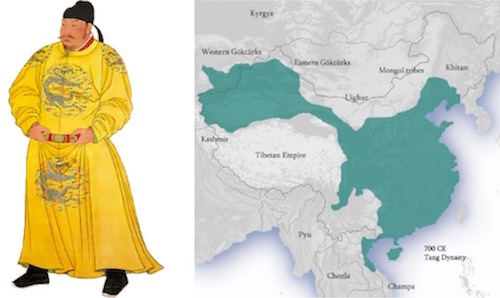 In the time of the accomplished Emperor Tai-tsung, the illustrious and magnificent founder of the dynasty, among the enlightened and holy men who arrived was the most-virtuous Olopun, from the country of Syria. …Observing the azure clouds, he bore the true sacred books; beholding the direction of the winds, he braved difficulties and dangers. 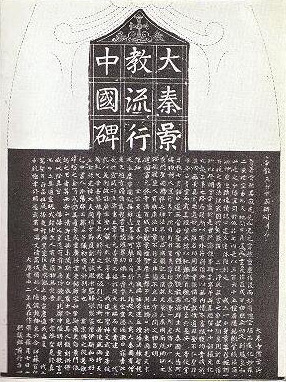 In the year of our Lord 635 he arrived at Chang-an; the Emperor sent his Prime Minister, Duke Fang Hiuen-ling; who, carrying the official staff to the west border, conducted his guest into the interior; the sacred books were translated in the imperial library, the sovereign investigated the subject in his private apartments; when becoming deeply impressed with the rectitude and truth of the religion, he gave special orders for its dissemination. 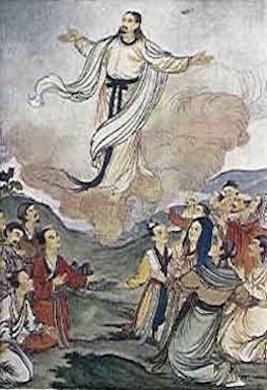 Restoration of Tang dynasty Nestorian image of Jesus Christ — Found in the Library Cave. 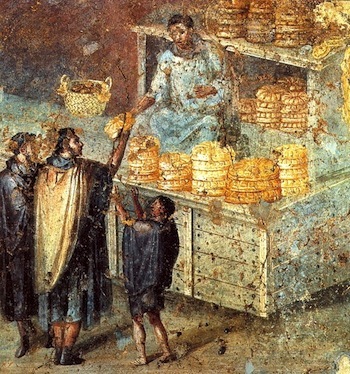 Original work dated back to 9th century. 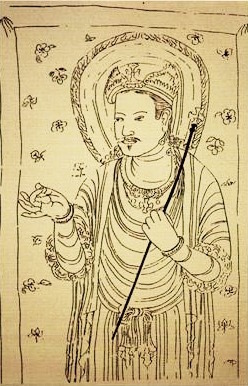 When the virtue of the Chau Dynasty declined, the rider on the azure ox ascended to the west; the principles of the great Tang becoming resplendent, the Illustrious breezes have come to fan the East….moreover, practicing the discipline of the Illustrious Religion, he (Emperor) distributed his riches in deeds of benevolence; every year he assembled those in the sacred office from four churches, and respectfully engaged them for fifty days in purification and preparation; the naked came and were clothed; the sick were attended to and restored; the dead were buried in repose; even among the most pure and self-denying of the Buddhists, such excellence was never heard of; the white-clad members of the Illustrious Congregation, now considering these men, have desired to engrave a broad tablet, in order to set forth a eulogy of their magnanimous deeds. He raised up the earth and established the heavens. All bearing witness to his true original. 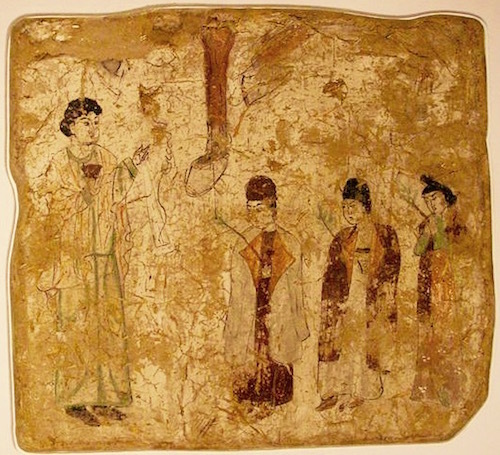 Nestorian priests in a procession on Palm Sunday in a 7th or 8th century wall painting in a Nestorian church in Tang China.